The Restaurants to Love section at Killing Thyme does not include arranged reviews. This is me (Dana) touting the restaurants I love. If you would like your restaurant reviewed and rated, please see the Product Reviews and Restaurant Reviews section under the Work With Me tab. I’d be happy to arrange a date! To say that life was hectic between our wedding in October through to the new year would be a complete understatement. Our families live in Canada and in PA, so with our wedding, honeymoon, and Christmas… travel hadn’t exactly been light. By January, we were wiped. A special night out was exactly what the Doctor ordered. The day we made our reservation was the warmest and most rejuvenating February day I’d ever seen in my 33 years of life–spoken like a true Canuck, I know! I excitedly took the opportunity to wear my bright coral spring dress. After all, the weather indicated that it was time to shed the “winter blues”, and heading out for a quiet evening together all dressed up seemed like the perfect way to feel renewed. We needed this. 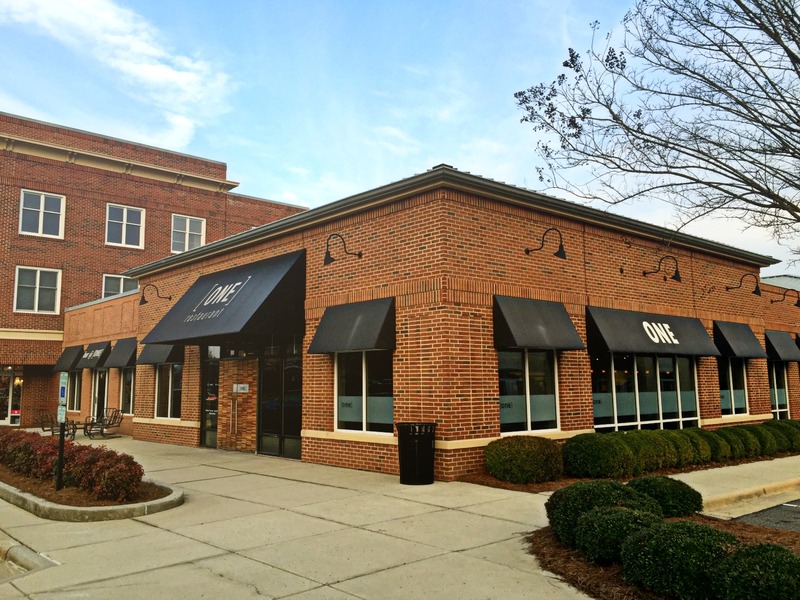 [ONE] Restaurant is located in the new urbanist village community of Meadowmont Village in Chapel Hill. (Fun fact: In 2008, Chapel Hill was recognized as one of America’s “Foodiest Small Towns” by Bon Appétit. I wonder what they’d have to say 8 years later!) The village is incredibly welcoming and boasts a great sense of community with its modernized yet cushy environment. The village encompasses restaurants that fill the air with the smell of wood oven pizzas; I also noticed an ice cream parlor (I would), a cafe, a boutique, a salon, and a wellness center. Above all of the swanky commercial spaces, you’ll find stylish apartments. (Apparently stylish people leave their blinds open at night.) This is definitely a place anyone could get used to. A few weeks before our reservation date I perused the [ONE] Restaurant Website. I was bewildered by their food presentation and photos, but I was starting to think that this might be a place you leave hungry. I’m happy to say that isn’t the case. When you first enter the restaurant, you’re greeted by a hostess and, more noticeably, an eye-popping wall of wines backlit with a dreamy pale blue glow. Excitement right out of the gate! The decor is minimalistic, slightly mod, monochromatic, and chic. Though classy, it doesn’t feel like a joint for the stuffed-shirt fuddy-duddy. The kitchen area is open to the dining room, yet you could hear a pin drop in there. The aura coming from the kitchen exhibits confidence, experience, and impressive coordination. It’s clear to me that the owners of [ONE] are running a very well-oiled machine and I couldn’t help but watch the chefs with great respect and admiration. We ordered some drinks before we started to peruse the inventive menu. The hubs ordered the Heretic Red IPA and I went for a Dafnes Vidiano, Doulofokis, Crete, Greece, 2014 (in other words, white wine). It was super refreshing and crisp. Numnum. All the wine, please! I absolutely love the way the menu is set up. They list the ingredients, placing the main ingredient between [brackets] so you can easily identify what’s going on. The fun part is that there is no indication of how the dish is assembled; you’re simply aware of the components. So when the waiter comes by with your plate, it’s a pleasant surprise. I kicked my meal off with the [Spanish Octopus] served with black rice, calabrian chili, white almond sofritto, and celery branch. When this dish was placed in front of me, I was in awe. I’d never seen octopus prepared so perfectly in my life. When I bit into my first piece, I’m pretty sure my eyes rolled to the back of my head in a fit of bliss. And maybe my toes curled. And maybe I… okay, I’ll stop there. I ate this dish as slowly as possible because I never wanted it to end. The black rice was cooked to perfection–almost risotto-like–and despite hating celery my entire life, I ate the pieces of celery branch. I wanted to experience the dish as it was intended, and I ended up loving it all. Are you proud, Mom and Dad? I ated celeries! My husband kicked his meal off with this gorgeous head of broccoli. Picking an entree was tough, because despite my pescetarian diet, they had a few dishes I could eat and they all sounded delicious. I was torn between the scallops and the swordfish belly, so I asked our waiter for some input. He admitted to having a weakness for scallops (much like myself), but mentioned that the swordfish belly was a new addition to the menu and it had some great reviews. So, I went for it. The swordfish belly was incredibly tender, and the flavor combinations here were so exciting. I’m pretty sure that I looked at my husband in disbelief after every bite with a big goofy grin on my face. I tasted richness; then there was tartness; then sweetness. None of the flavors were meddled together, either. Everything stood out. My husband went for the pork. He’s usually a beef guy when we go to restaurants, so I was really excited that he’d decided to step outside of his comfort zone. I was also very excited because I got to eat my husbands potatoes (he hates potatoes and I couldn’t let those perfect little spuds go to waste). I ignored the fact that they had some borderlaise sauce on them. Just this once.. I couldn’t try the pork, but my husband reported that it was the most tender pork loin he’d ever tasted and he was so glad that he went with that dish. As you can see, the portions at [ONE] are not as small-scale as they appear in the Website’s photo gallery. You’re not going to over eat, which is a good thing, but you should leave feeling satisfied. In a nutshell, this whole experience was fulfilling. The atmosphere was great, I had the best date in the world, the plating was beautiful, the quality of food was impeccable, and the flavor combinations were really exhilarating. I was impressed by not only the creativity on these plates, but the way everything just worked together. We skipped on dessert because we’re suckers for ice cream parlors and there just happened to be a super cute one across the street. So, we decided to ride on our high by walking around Meadowmont Village, ice cream cones in hand, filling the warm evening air with laughter and bad jokes. It was euphoric.